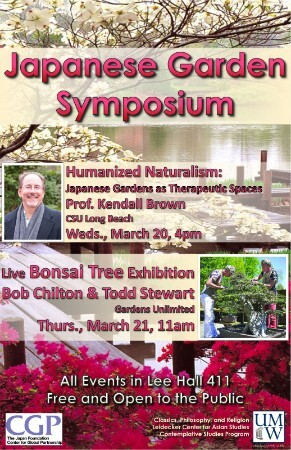 This symposium will consist of a presentation by Dr. Kendall Brown, Professor of California State University, Long Beach, which focuses on the theme of “Humanized Naturalism: Japanese Gardens as Therapeutic Spaces”. A live Bonsai tree exhibition will also be held at the campus (Lee Hall 411) where a cozy Japanese garden is located. Bob Chilton and Todd Stewart from Gardens Unlimited will present during the exhibition. This event is co-organized by CGP and the Leidecker Center for Asian Studies at the University of Mary Washington College of Arts and Sciences.